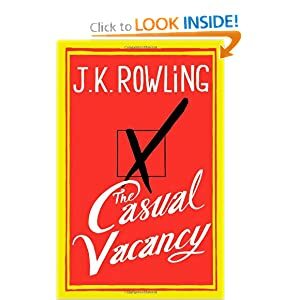 I started The Casual Vacancy with eyes wide open to the fact that this was no Harry Potter novel–and yet, even though I wasn’t offended by the much more adult tone (and content!) that Rowling establishes right out of the gate, I was a little surprised by it. No matter how prepared you are, it’s just weird to hear the f-bomb dropped by one of Hermione Granger’s literary cousins. What didn’t surprise me at all, though, having read and loved multiple analyses of them, was Rowling’s masterful plotting and the literary alchemy she weaves to engage the reader and drive the story. Indeed, that is what merited my 4 stars for the book. Pagford is a small town that seems idyllic on the surface, but underneath the veneer of folksy charm the place is roiling with class warfare, sexual tension, violence, back-stabbing and duplicity. Rowling’s characters are broken, wounded, cynical, crass, self-centered, petty, and strangely sympathetic. The reader gets a first-person perspective from everyone as each maneuvers around the other, reading (and often misreading) the circumstances from a unique and limited vantage point–to hilarious but often tragic effects. This is a book about the mundane. There is no cosmic battle, no good vs evil motif, no characters righteous nor wholly despicable. Beyond the events in the finale, there is almost no physical “action.” What there is takes but a few pages; the real climactic focus is the cathartic effect those events have on the people of Pagford. Since the book is entirely character driven, it took me about 50-60% to get really invested in the story, to actually care about those involved and to be able to tell them apart. Rowling introduces us to so many people so quickly that, until you know how they all intertwine, it can be hard to keep track of them. But by the end, Rowling uses tragic events to perform the alchemical work of fundamentally transforming her characters: rekindling romance in a marriage, uncovering an affair, breaking down facades of derision and indifference, facing guilt for the first time, mending parent-child relationships, forcing major choices. Life is nasty, brutish and short–and the messiness of Pagford illustrates that cliche with a depressing beauty. I had one main disappointment: missing from the story was any character who exhibited evidence of real, character-transforming Christian faith. Not a Ned Flanders, but someone who actually tries to live as a disciple of Jesus, however imperfectly. Not to say that there wasn’t redemption of sorts, and of course a story doesn’t need an explicitly Christian character in it to be complete. Yet one wonders how even one person like that could have contributed to the alchemical crucible that transformed the world of Pagford. USA Today Article About JK Rowling's new book for adults.